India Sudar Conducted the Career Guidance program for Govt Schools madurai on 28-Aug-2010. We have conducted the following program as part of the Career Guidance books distribution. We have distributed the Career Guidance books the following schools. 1) I would like to thank UmaRani(Hope Trust) to provide this opportunities to conduct the program in Madurai. Without UmaRani we cannot able to achieve the program big success in Madurai. We thought of planning to conduct this kind program in and around Madurai rural area. Once again i thank you UmaRani for making this program big success. Once again I thank you all for make the program big success. Indira Gandhi International Academy (IGIA), Jakkur, Bangalore is a residiatial school for more than 300 srilankan refugee students at Jakkur, Bangalore and India Sudar is supporting for their education by deploying teachers ,providing note books and stationaries. Also, India Sudar conducted medical camp at IGIA last year and the doctors recommended to arrange for safe drinking water after seeing the kind of deseases diagnosed with most of the students. In the past few months, there are 30 to 40 students fell ill every week due to water contamination. The students consumes borewell water without any purifier. 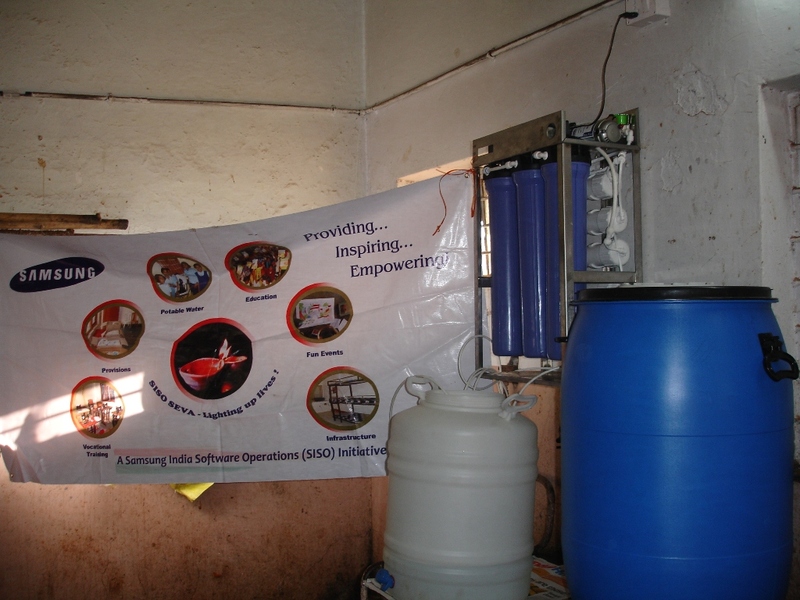 Though India Sudar is not involved in any infrastructure project, we approached our partner organization and corporates to set up water purifier. 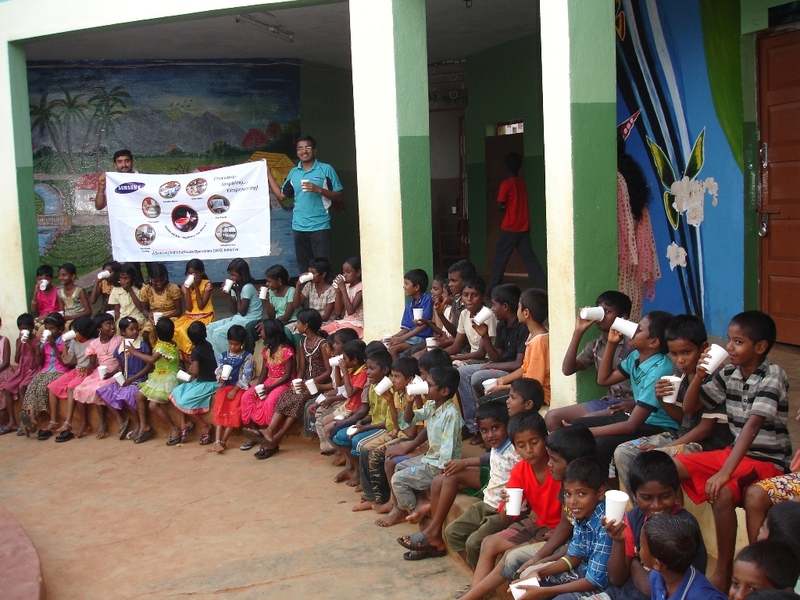 Finally, SAMSUNG SEVA Team sponsored WATER PURIFIER from life gaurd sales and service last week. It is installed and working fine. We visited the school and verified the quality of water on last sunday. All the 300 students and 20 staff are very happy about it. India Sudar express our sincere thanks to SAMSUNG SEVA TEAM. Project report and thanks letter from IGIA is attached for your reference. I went to Bhimaliya at our India Sudar learning Center, I bought the 2 mat and 1 Chair for the Center or students. I got the exam of the our center students, Really there are some students are good but some very poor in education, I found out after checking the exam copies. I ADVICE TO TEACHER FOR TEACH THEM GOOD , WHO ARE WEAK. She started teaching to children from July 2010 and until 22 Aug 2010< she did good work for very weak and poor student. They don’t know. She told me that I am teaching to them with my good work. I gave some directions to her for develop students education goal and better study. she will do good more work for students. About the Family and students _ There are coming everyday the students for teaching to our center. I consult to many families about the Education of their child. They are VERY HAPPY TO OUR INDIA SUDAR LEARNING CENTER. I did discuss about the "how can we do more develop’ you child education. They all depent all Agriculture. they are very happy to our center. Dress Code_ I discuss with poor families and students and our Teacher. There are really need of Dress for our India sudar Student. They said to Me "Sir When will give you dress and shoes to us" marwari – सर थे म्‍हानै ड्रेस व बूट कदै देवैला" I said to themj, Dear boys I will tell to our Center chief and He will provide the all things to you. We are going to conduct the Career Guidance books distribution for Govt Higher Sec School Madurai. I am happy to invite you all to come and attend the function. Please find the Agenda for the Program. If you are interested to participate in the event please keep in touch with me. 2009 – 2010 – 1144 \ 12000 is the school first in 12 th class. Most of the students (90 % ) belong to BPL family. 2009 – 2010 – 92 % in 12 th class. One hour will be allocated to all the students in a week, so that they can use our library in an effective way. We will conduct essay writing, oral presentation in the school down the line. Our competition will be based on the books available in the library. School HM and staffs were very happy about our initiation. They promised me to utilize our library in a most possible way. 2. Shree Aathi , Who send DD & Cheque to publisher. Please find the attachment for project report. "Socialist by heart, Capitalist by mind"
I received one request for college tution fees. She needs Rs 5000 for college fees. If anyone interested pls let me know. Today(18-Aug) we have collected Rs.1775 from India Sudar Donation Box at LandMark Chennai. We have installed the donation three months back. If we have collected Rs.500 from each donation box per month then the total amount (Rs500 X 10 = 5000) is used to pay the tuition fee for the four teacher. Two months of collection(Rs.10,000) is enough is to setup a one library. So Request your help to support this activity. India Sudar started the Donation Box activity for the fund raising program. So for India Sudar Installed five donation box in chennai. We have installed the donation box for India Sudar promotional activity also. So that we have installed the donation box in popular places like Landmark, Odyssey. Still we have to install six donation box in chennai. If anybody have the good contact with famous shop in chennai, please get their permission to install the donation box in their shop. India Sudar requested Volunteer to come forward to get the permission from shops to install the donation box for our fund raising activity.